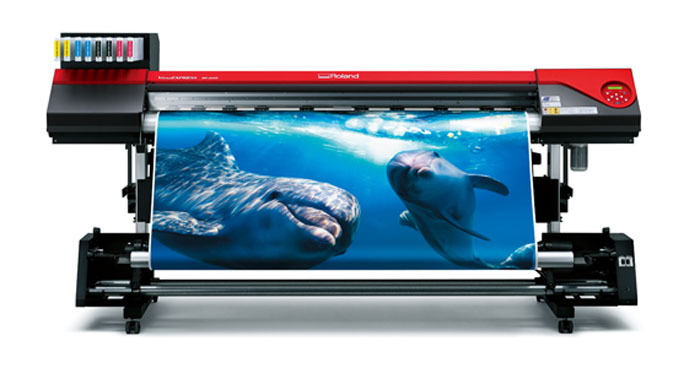 On the 2nd of July, Roland has introduced its new wide-format inkjet VersaEXPRESS RF-640, which is 64 inch wide. Roland DG Corporation is world widely known for the inkjets, milling and engraving machines, photo impact printers, vinyl cutters and for the development of Print&Cut technology. The new model is a four-inks and prints on a wide web material with the speed up to 48.5m²/h (360×360 dpi). According to the company, the machine boasts high quality output and productivity, simplicity of use and servicing, and long life time. Moreover, the novelty is equipped with a new app for tablets – Roland Printer Assist iPad – for remote managing of the printer. Freshly created Roland Ink Switching System certainly belongs to the advantages of RF-640 too. It provides four additional cartridges of the same color, on which the printer switches, when the main ones are empty. Ink consumption of RF-640 is 20% lower than that of the previous model VersaArt RE-640. The printer is run by a ruster image processor VersaWorks RIP. It includes, among other, media profiles and PANTONE® libraries for precise color matching while printing. Sign shops and print service providers seem to get meeting all their demands tool at a fair price. In the near future VersaEXPRESS RF-640 will appear in the showrooms of the authorized dealers of Roland. This entry was posted on Thursday, July 10th, 2014 at 9:06 am	and is filed under inkjet, printer. "Epson Renews Its Workforce Line Of Inkjet Printers And MFPs"